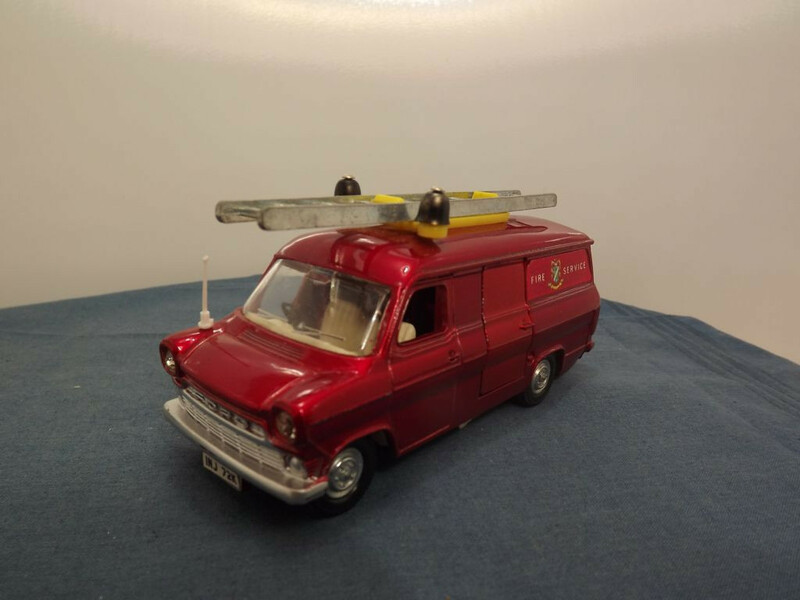 This model is the Dinky 286-G-1 Ford Transit Fire Appliance in Metallic Dark Red Fire Service livery. This item uses the type 1 body casting. that features a sliding driver's door, two opening rear doors and a side door opening into the van's rear compartment. At the front the grille, side lights, bumper and number plate are cast into the body casting and mask sprayed silver. The actual number plate [INJ 72K] is represented by a paper label with black lettering on a white background. The front head lights are represented by two clear 6mm "crystal" lenses. The right hand side wing carries a white plastic aerial. The right hand (driver's) side features a sliding door that opens to reveal the interior. On the left hand side, the front door is cast into the body and the rear compartment is accessed via hinged, mid-body door which, when opened, reveals two yellow and silver plastic axes mounted on the inside of the door. 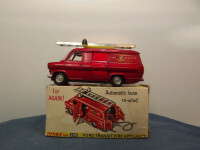 The rear body on both sides carry paper labels featuring the words "Fire Service" in white and a crest/coat of arms, all on a red background. 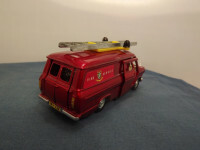 The rear of the van has two hinged opening doors that reveal the red and silver pump housing and yellow retractable hose with silver nozzle that is mounted inside the rear of the van. The right hand door has "Transit" cast along its bottom edge. Either side of the rear doors is a painted yellow rear light molding. Below the doors is the mask sprayed, silver bumper and number plate (black on yellow background paper label). The roof is red with a yellow plastic mounting that the ladder clips onto. Either side of the ladder is a black plastic "bell", held onto the mounting by a metal, dome headed pin. The interior consists of a cream plastic firewall, dashboard, seats and floor at the front. A black plastic steering wheel is inserted into the dashboard. At the rear is the red and silver pump housing. It has a bare metal lever, accessible via the side door, that retracts the hose into the vehicle. The housing has been glued to the cream interior molding. All wheels consist of cast metal hubs, of a 5 stud commercial style, with black rubber tyres. 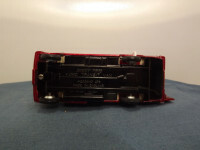 The baseplate is black painted metal. 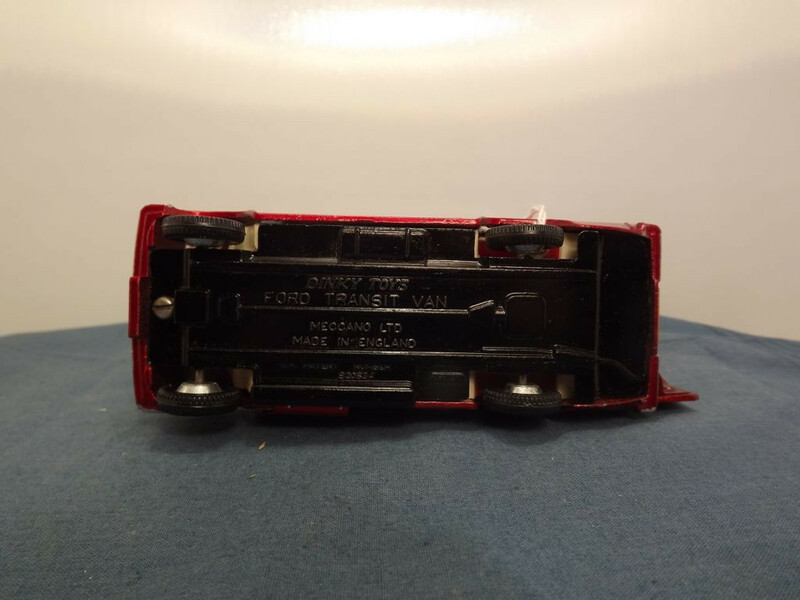 At the top centre, above the rudimentary representation of the drive shaft, it has "Dinky Toys, Ford Transit Van" on two lines, "Mecano Ltd, Made in England" on two lines below the drive shaft, and "UK Patent Number, 920534" on two lines at the bottom centre. It is held in place by a single self tapping screw at the front and a body locating lug at the rear. This item was issued between 1969 and 1975 and comes with its original Yellow, Red, and White picture box and printed instruction sheet.